Making the buzz on the internet is a video of purported cruelty at a plant that processes newly born baby chicks. Clearly some of the practices shown are not humane. While I do believe in the supremacy of human beings in the natural order (I guess that makes me a speciest in PETA terms) - I also believe that we are "stewards" of this planet which is in actuality the creation and property of Almighty G*d.
If you watch the video, at about 3:05 hear the narrator, in a horrified voice, intone "and here sick, injured, and deformed chicks are removed for destruction..." Is this not precisely what is being done to hundreds of thousands of unborn children in thousands of hospitals and clinics across the United States? Margaret Sanger must be smiling in whatever pit of Hell she now resides over this fact, her eugenic heart beaming at how all the unwanted and undesirables are being weeded from our gene pool. Whenever you here President Obama prattle on about liberating "science" from the constraints of Judeo-Christian morality, he's spewing the same vile poison that Sanger was 75+ years ago. What struck me most in watching the video, however, was the knowledge, absolute knowledge, that what is being done to ABORTED CHILDREN so outweighs the inhumane treatment of animals. I wonder if the making of a video clinically describing what occurs during an abortion process, or perhaps actually filming an abortion, would wake our fellow citizens up? Undoubtedly such films exist, and are being given no notice by our hedonist media culture. Relatedly, GE Healthcare is trumpeting the fact that their research using human stem cells will negate the neccessity of experimenting on animals. Finally - "PETA sees the research (human stem cell research) as having the potential to end the vast majority of animal testing." -"The Devil has the world by the throat." 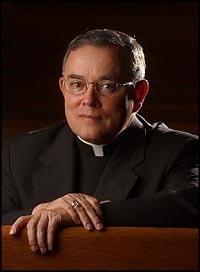 Mission San Juan Capistrano Basilica Pastor, Fr. 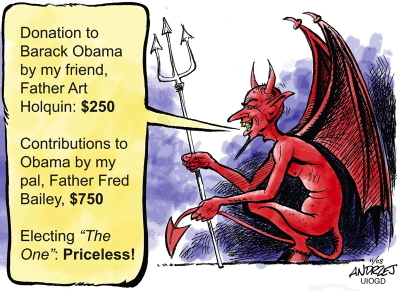 Art Holquin, gave money to Barack Obama's campaign. So did Fr. 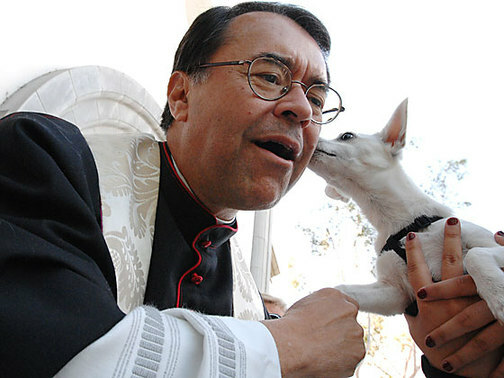 Fred Bailey, pastor of Corpus Christi parish in Aliso Viejo, of Halloween Mass & Barney blessing fame. Obama On Abortion At Saddleback Forum: Misstep? Barack Obama's answer to Rick Warren's abortion continues to generate conversation, and is generally viewed as a "misstep." That's true in a political sense, since the Obama campaign's effort is to deflect attention from his extreme pro-choice record. Obama's response to Warren did terrific damage to that effort. Personally, I see it as more clarifying.. clarifying for those faithful Catholics who have taken leave of their sense and endorsed Obama, despite what ought to be their better judgment. I have Doug Kmiec specifically in mind. China sends antiabortion protester back to Phila. Deported from China on the eve of the Beijing Olympic Games, Michael McMonagle, 55, of Lansdale, believes he was able to draw attention last week to China's problems of religious freedom and forced abortions. McMonagle, a veteran Catholic antiabortion activist, and two other protesters tried to pray and unfurl a "Jesus Christ is King" banner in Tiananmen Square on Wednesday and Thursday. But when the protesters tried to hold a news conference with foreign reporters in the square, Chinese police sent them packing. McMonagle returned to Philadelphia on Friday. With the one-child policy that encourages abortions, couples can now have more than one child - if they pay a fine. For many families, that can be more than a year's salary. "Olympism seeks to create a way of life based on the joy of effort, the educational value of good example and respect for universal fundamental ethical principles." 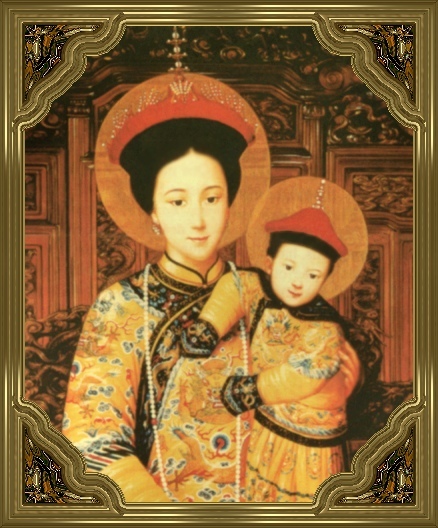 Our Lady of Peking, Pray for Us and the Unborn of China!